Welcome back to Forex professional training. The components and specifications of R-strategy is described thoroughly in session 94. Due to high performance of this strategy, it is suitable for Options market especially on Trend markets with suitable slope. After fluctuations of price trend near the Trend line, if a powerful reversal candlestick pattern forms near the Trend line then a reversal spot can be detected. The Overbought/Oversold conditions by RSI or Stochastic will confirm the generated signal as well. The bullish signal will be generated after price decreases toward the Trend line and a powerful reversal candlestick appears. The Trend line must connect at least 2 valleys on the bearish trend. If RSI line passes the level 30 or Stochastic line passes the level 20 toward top then the reversal spot can be detected and the bullish trend is confirmed. The bearish signal will be generated after price increases toward the Trend line and a powerful reversal candlestick appears. The Trend line must connect at least 2 peaks on the bullish trend. If RSI line passes the level 70 or Stochastic line passes the level 80 toward bottom then the reversal spot can be detected and the bearish trend is confirmed. Now let’s check some examples of this strategy. The NZDUSD price has decreased and a Trend line can be plotted by connecting three valleys. The price proceeded toward the Trend line which acts as a support line. An Engulfing candlestick pattern appeared near the Trend line to specify the reversal spot toward up. The next example shows a bearish signal in which Trend line (resistance line) connects the peaks on a bullish trend. As price went near the Trend line, a Shooting Star pattern formed and the reversal spot is determined for the downward trend. After fluctuations of price trend near the Trend line, when price crosses the Trend line with Closing price on the other side of the Trend line and then a powerful reversal candlestick pattern forms then a reversal spot can be detected. The Overbought/Oversold conditions by RSI or Stochastic will confirm the generated signal as well. Bullish format: After price decreases toward the Trend line and crosses the Trend Line with a candlestick, which the Closing price is below the Trend line, if a powerful reversal candlestick appears then a bullish signal will be generated. The Trend line must connect at least 2 valleys on the bearish trend. If RSI line passes the level 30 or Stochastic line passes the level 20 toward top then the reversal spot can be detected and the bullish trend is confirmed. Bearish format: After price increases toward the Trend line and crosses the Trend line with a candlestick, which the closing price is over the Trend line, if a powerful reversal candlestick appears then a bearish signal will be generated. The Trend line must connect at least 2 peaks on the bullish trend. If RSI line passes the level 70 or Stochastic line passes the level 80 toward bottom then the reversal spot can be detected and the bearish trend is confirmed. On the CADJPY price chart, Trend line connects at least 3 valleys with support effect on price movement. After price crossed the Trend line, the Closing price of the bearish candlestick formed lower than the resistance line. A powerful bullish candlestick pattern formed to confirm the bullish trend. In the next example, Trend line as resistance line has connected 4 peaks. A long bullish candlestick pattern crossed the Trend line with Closing price over it. A powerful bearish candlestick just formed after that with Closing price below the Trend Line to confirm the reversal downward spot. In this type, after fluctuations of price trend near the Trend line, when price crosses the Trend completely, if a powerful reversal candlestick pattern forms then a reversal spot can be detected. The Overbought/Oversold conditions by RSI or Stochastic will confirm the generated signal as well. Bullish format: After price decreases toward the Trend line and crosses the Trend Line completely, if a powerful bullish candlestick appears then a signal will be generated. The Trend line must connect at least 2 valleys on the bearish trend. If RSI line passes the level 30 or Stochastic line passes the level 20 toward top then the reversal spot can be detected and the bullish trend is confirmed. Bearish format: After price increases toward the Trend line and crosses the Trend line completely, if a powerful bearish candlestick appears then a signal will be generated. The Trend line must connect at least 2 peaks on the bullish trend. If RSI line passes the level 70 or Stochastic line passes the level 80 toward bottom then the reversal spot can be detected and the bearish trend is confirmed. On EURGBP price trend, Trend line has connected 3 valleys. The price then crossed the Trend line (support line) completely and a bullish Hammer candlestick below the Trend line appeared to specify the reversal spot toward top. In the next example, the Trend line connects 3 peaks of the bullish trend. Then price passed the Trend line, which acts as a resistance line, toward top. Finally a powerful Shooting Star candlestick pattern formed above the Trend line to determine the reversal spot for the bearish trend. 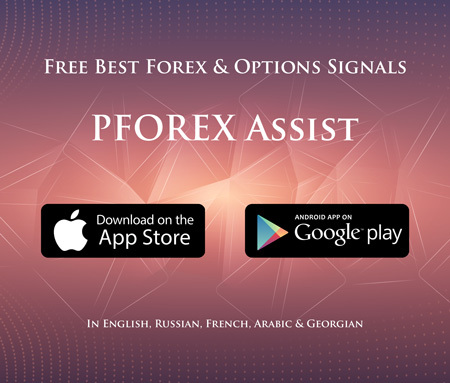 You can download PFOREX Assist app for iOS and other platforms devices to receive these signals instantly, however I have to insist that all the services provided PFOREX are as information, not as suggestion nor advice. That concludes this session, until next time and another session, take care.